The militants nine times breached the ceasefire in the ATO zone. Over the past day in the area of the anti-terrorist operation in Donbas the enemy waged nine shelling attacks at the positions of Ukrainian servicemen, the ATO press center said Friday in a Facebook report. "Unfortunately, our servicemen sustained losses again. One Ukrainian soldier was killed, two were wounded and two injured," the report said. In the Luhansk area, the Svitlodarsk bulge was the hottest spot as the terrorists shelled the area of Luhanske from 120- and 82-mm mortars and heavy machine guns. They also fired grenade launchers at the defenders of Novoluhanske. Ukrainian troops returned fire. In the area of Novozvanivka, the militants, in breach of the Chrismass ceasefire, fired heavy machine guns. In the Donetsk sector, the areas of Shyrokyne, Hnutove and Lebedynske on the Azov Sea coast, were shelled from 120- and 82-mm mortars. 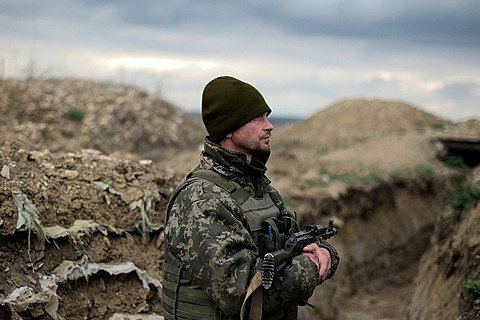 The militants also used 120- and 82-mm mortars in the vicinity of Pisky. Also, several spans of enemy drones were recorded. Update. The Ministry of Defence said that Ukrainian soldier was killed in the explosion of a landmine during the demining in the Donetsk sector. "Two more of our servicemen were wounded and two injured. They were promptly taken to military hospitals and given urgent medical assistance. Their lives now do not threaten anything," the ATO spokesman Vasyl Labay told TV channel 112-Ukraine on Friday. He also said it was quiet all along the line of demarcation since the beginning of the day.